This blog was made for the class Humanities 399: Library as Collaboratory. Students had the choice to select from a variety of different projects to expand their knowledge as liberal arts students and grow their knowledge about a small library project. It was meant to be a very reflective project and encourage students to think about their own skills they have developed as students while also working to push themselves to apply those skills in new ways. A zine is a self-published publication, often motivated by a desire for some form of creative self-expression, not for profit. People sometimes will sell zines, but it usually is just to cover the costs of productions. They can range from short comics or short stories to critical literature such as anarchist literature, feminist literature, etc. How does one collect these zines and make them accessible to others? There are many different ways that Zines are collected. They can be collected through various festivals (referenced by many of the different zines in the collection I worked with) or various projects that make them more accessible to a wider audience. One of these that I discovered that I wanted to highlight was The Zine Archive and Publishing Project (ZAPP) which is an entirely volunteer based archive of 30,000 plus self-published materials that are meant to “validate publications outside the literary mainstream” for people to have access to (http://zappseattle.org/wp/about-2-0/). They are able to hold various events to display the large amount of content they are working with, all in the pursuit of increasing access to these zines. Speaking of which, it is important to note that there is no one zine, they are all unique in their content and varied in the way they are put together. 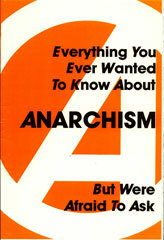 This first zine begins in a more radical fashion as it was first published by what is called The Anarchist Media Group and is meant to help people understand what anarchism is because “there is probably more rubbish talked about anarchism than any other political idea” which they hope to address. This literature embodies more of the critical approaches seen in zines that seek to disrupt the idea of authority and challenge people to think critically about previous conceptions they had about state formation. It even includes a final portion that provides a list of further things to read that builds upon the zine. This next zine is much tamer in tone and serves to mainly provide small suggestions for life such as “try not to worry too much” about anything (something that the anarchists probably would disagree with) which pretty aptly sums up the entire zine. These short words of suggestion are merely meant to be ideas offered to whoever ends up reading them and represents the more whimsical zines that are published. 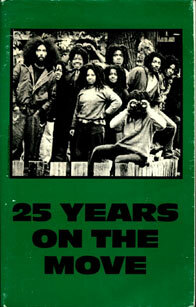 The next zine is similar to the one about anarchism, but this also provides a more narrative history about the work of a group called MOVE which was based in West Philadelphia. The group was meant to facilitate a revolution to “show people how corrupt, rotten, criminally enslaving this system is” by being a positive force in the community and also take place in various demonstrations against the police. The zine chronicles the history of the group and the various conflicts they got into that led them to be branded as terrorists in the struggle that they are continuing to educate about. This next zine is a comic that tells the story of a hero named Danger Flamethrower who is a detective that is attempting to solve a crime. It is humorous in tone and even crossing into absurd with a chicken randomly entering the story to complicate matters. This piece shows how zines can be silly without having to even make the most sense and can instead embrace a more chaotic approach to whatever they publish. 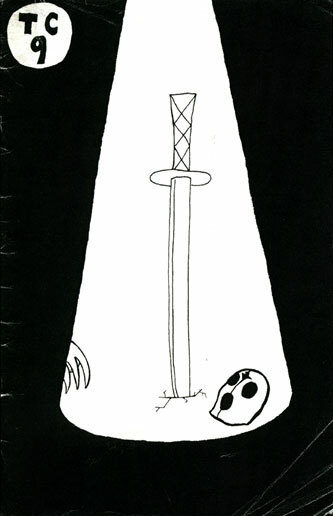 This zine takes the narrative aspect seen previously but makes it the central focus. 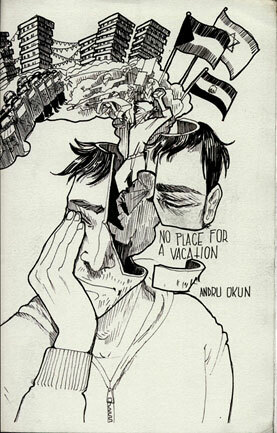 It is the self-told narrative about the author, Andru Okun, going for 3 months to travel through Israel, Palestine, Egypt, and Jordan. It serves as not just as a physical journey however, but is instead also a spiritual journey where the author grows as a person as well. Throughout one sees various conflicts that make for a compelling story and another form of a zine worth highlighting. This ideally will be then used to assist in the collection that is put together to better organize what ended up being a lot of zines that were incredibly varied in the content and construction of them. So what should be done with Zines? Continue to make them accessible in libraries, exhibits, databases, and however they can be shown to better inform folks about what this unique form of publications truly are!